Porto’s streets and squares are littered with churches and chapels of architectural and historical interest. Most tourists probably try to visit the Cathedral or Sé, perhaps climb the Torre de Clerigos attached to the church of a similar name, and see some of the city’s other famous churches, such as the Igreja de Carmo and the neighbouring Igreja des Carmelitas, or the Igreja da Vitória and the Moistero de Sao Bento da Vitória, built on the sites of former synagogues in the old Jewish Quarter. But sometimes last week I stumbled across a small church or chapel unexpectedly in a quiet side street or small square. The Capella dos Alfaiates or the Tailors’ Chapel was originally built in the grounds of the Sé or Cathedral in 1554. However, almost four centuries later, building works in the grounds of the cathedral in 1953 led to the chapel being moved to its present location, some 200 metres east of the cathedral. 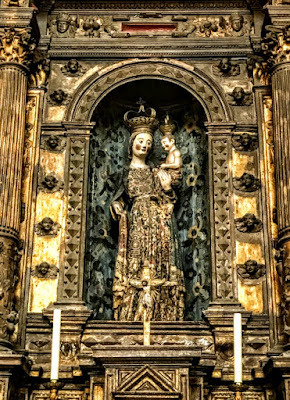 The official dedication of this chapel is Nossa Senhora de Agosto, or Our Lady of August. Saint Bom Homen and Our Lady of August were the protectors of the Tailors’ Guild. The guild had its own chapel in a house adjoining the cathedral, where the ground floor was used as the granary of the cathedral chapter, and the first floor was used as the guild chapel. Work began on building a new chapel in 1554, opposite the main façade of the cathedral, and this granted to the guild by Bishop Rodrigo Pinheiro. This rectangular chapel, built in the Mannerist style, is important in the history of church architecture in northern Portugal because it marks the transition from late Gothic to new Mannerist forms based on Flemish inspiration. However, by 1565, only the walls had been completed. Thanks to the generosity of the bishop, the guild hired the master stonemason Manuel Luís to complete the project. The portico of the chapel is flanked by two fluted Corinthians columns on pedestals crowned by a niche with Flemish decoration by Manuel Luís which house the terracotta image of Nossa Senhora de Agosto. The large window filling the upper part of the façade is the main source of light for the chapel inside. Inside, the 16th century altarpiece is divided into panels each depicting a scene in the life of the Virgin Mary. It is strongly influenced by the precepts of the Council of Trent, which were circulated in Portugal from 1580 onwards. The paintings, attributed to Francisco Correia and others, were probably completed between 1590 and 1600. 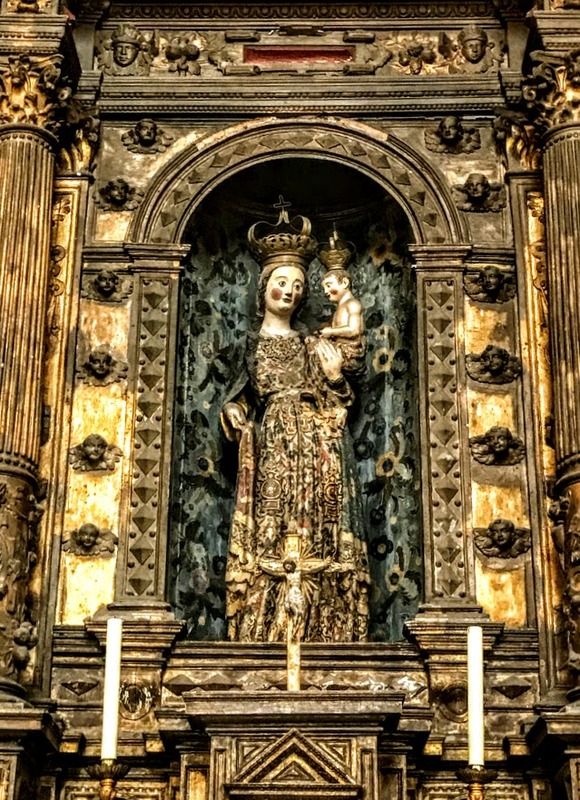 In the centre of the altarpiece, the limestone statue of Our Lady of August dates back to an earlier period, and it is an interesting example of the influence of north European imagery on Portuguese work. A crosspiece arch, set on Ionic pilasters, separates the nave from the main chapel, covered by a small barrel vault, with two sections formed by panels of decorated granite that spring from classical corbels. The Guild of Tailors commissioned repair work carried out on the chapel in 1853. 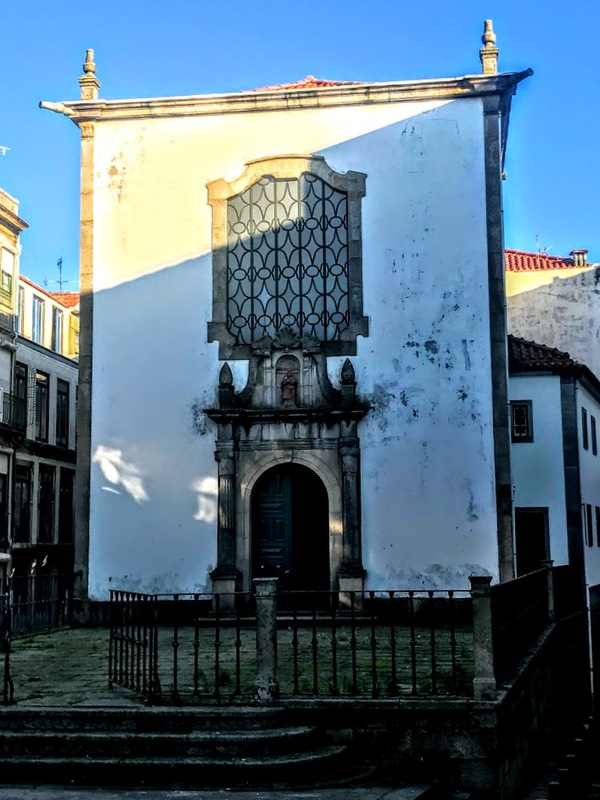 The chapel was declared a national monument in 1927, but it was requisitioned by the city council in 1935 in preparation for demolition works clearing land around Porto Cathedral. 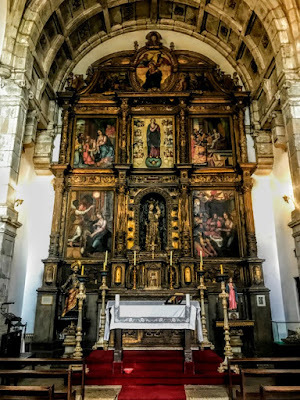 It was taken apart carefully in 1940 and was rebuilt intact in its present location in 1953, when the altarpieces were carefully restored by the artist Abel de Moura.